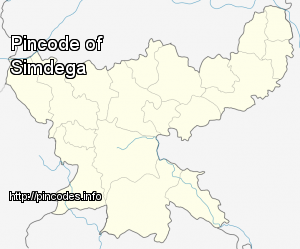 Simdega is a City in the Indian state of Jharkhand .Simdega is the administrative headquarters of the eponymous District and Subdivision.The city stands at an elevation of approximately 418�metres (1371�feet) above sea level and covers an area of 3,750 square kilometre.Bounded in the north by Gumla , on the east by Ranchi and West Singhbhum, on the west by Jashpur Nagar , Chhattisgarh and on the south by Rourkela , Odisha. It is accessible by road through National Highways (National Highway 23) from Rourkela and Ranchi. The nearest railway station is Rourkela railway station. Kodarma Lok Sabha constituency is one of the 14 Lok Sabha constituencies in Jharkhand state. This constituency covers the entire Koderma district and parts of Hazaribagh and Giridih districts. Khunti Lok Sabha constituency is one of the 14 Lok Sabha constituencies in Jharkhand state. This constituency is reserved for the candidates belonging to the Scheduled Tribes. This constituency covers the entire Khunti and Simdega district and parts of Ranchi and Seraikela Kharsawan districts.